A fun day full of excitement and a whole lot of turf races. 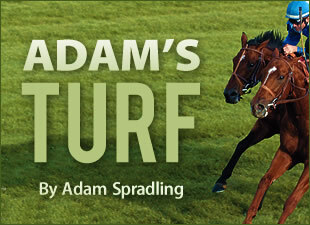 I love a good turf race and like to see "turf" sires run well on dirt. Specifically Giant Gizmo. I called that horse with a gut feeling, and yep, he sure showed his skills. Of course he is a Giant's Causeway, as faithful readers know Giant's Causeway is a favorite of mine. So hats off to Giant Gizmo and another stakes winner for Giant's Causeway! The first race was a huge win. An exacta that paid fifteen bucks on a one dollar boxed bet...so really six bucks. I also followed my good friend and highly skilled handicapper Jason Shandler. If you read some earlier blogs, I am homing in on my skills of handicapping and I greatly improved from learning new angles and some new betting styles that were previously unknown to me. Betting styles like a Keyed bet, where you can bet one horse who has to win and you can mix all other horses fininshing after the winning horse. A wheel bet, where you base all the horses around a specific horse. I studied the guide in the front in a lot more, on what all the stats truly mean in the past performances. I knew some, but it is a lot of information to read and remember. I think I have some strategies down now though. As I was on top for a while and the races I did lose money on, I lost by one horse. All the losses were with boxed exactas where my horses came in second and third, or first and third. It was frustrating to lose the money, but encouraging that I was so close to success. The Oaks was amazing to watch on the rail. The ladies just glided on the track like ice skaters. Elegant from beginning to end. Proud Spell had it in the bag, her workouts and watching her on the track was just too clear while filming in the morning this week. Ginger Punch dominated her race as well and that was seemingly a given also. It was nice to see that race with so many big names in this race. The Crown Royal was another turf race. I just can't get enough of turf races, and that turf track was getting pretty torn up by the end of the day. Weather also altered betting methods and track conditions which was a neat change in pace for the day. Sure it was wet and somewhat annoying, but I enjoyed having to try altering strategies, which worked, mid day. Paying more attention to slop, yielding or wet turf and Churchill Downs pas performances paid off. I could go on about the weather and other results from the rain, but I want to keep this post brief. Many good stories to tell from this week at some point. Aside from the great betting all day and the many races I won with, the comradeship with coworkers and having fun while working was great. Meeting all our wonderful freelancers who provide amazing images and writings on the industry was very exciting. I learned a good deal about how large events are held and how to attempt to organize it. Attempt being the key word after being a media member. Anyway, all the volunteers and grounds workers were very polite and kind to talk with. I want to thank them for their hard work and great handling of the huge crowd. 125,000 was the head count I believe for today. Speaking of the crowd, I have never seen so many variations in security uniforms, it was like seeing all the various units in Star Wars welcoming the arrival of the Emperor to the Death Star in Return of the Jedi. They are much appreciated though...remember to NOT bring umbrellas to a track. If you are coming for the Derby, I am quite confident there will be a very large lake in the in-field area. So bring your swimming gear. Be sure to continue watching the show And They're Off from the Derby, it is very fun and great information is passed to you. A lot of work has gone into those pieces, you will not be disappointed. I have not told all the stories so if you have questions or are wondering about anything going on this weekend, simply ask. Thanks!